We began our year by finishing up our Nourish Your Energy Reserves. This was a long series of 14 videos that took us through last winter. We then started adding to our Beginner’s Videos. This year we added ten beginner videos to our beginner’s class playlist. 🙂 Introduction to Spiritual Ecology, Introduction to Sun Salutations, Focus, Discipline, Flexibility, Easy to Follow, Step by Step, Slow Beginner, Balance, and Absolute Beginner Yoga. We love our beginner yogis. After doing several Beginner Yoga videos we began filming the Inner Critic Series in Tofino, British Columbia. What a beautiful vista for a truly life-transforming series. I don’t think I’ve ever heard from more of you about how transformative a yoga series has been for you. This 8-class series was a life changing for thousands of yogis around the world. After the heavy work of the descending journey, we needed a little levity, so I added to the Props classes with a Yoga for blocks class. I love putting together these props master classes and I have some plans for some more of these in 2016. We ascended from the depths with the Yoga for Gratitude series this summer. This series allowed us to expand and grow through the summer. We started by expressing gratitude for our bodies and our abilities to do the physical practice of yoga and moved through so many different aspects of gratitude. Autumn was upon us and I could finally create the series I had been waiting for, the Focused Living Series. This is one that I had been holding back on until fall for some time. My students had told me for a long time that staying focused was a big challenge for them. The focused living series was based on the Yamas and Niyamas and the teachings in Greg McKewon’s book, Essentialism. Many of you told me this was another highlight of your year and how well this series paired for you with the Inner Critic Series. We Re-Released the Bringing Violence Against Women Out of the Shadows into French, Italian, Spanish on International Violence Against Women’s Day on November 25th. This year there were even more translations of Namaste Yoga into Italian, Spanish, French, Russian, Finnish, Portuguese, Arabic and German. Thank you so much for your karma yoga and volunteering to translate Namaste Yoga into EIGHT! languages. I hear from people around the world every day about how much they appreciate the translations. I’m so excited to have new translators coming on board volunteering to translate even more episodes of Namaste Yoga into languages other than English. 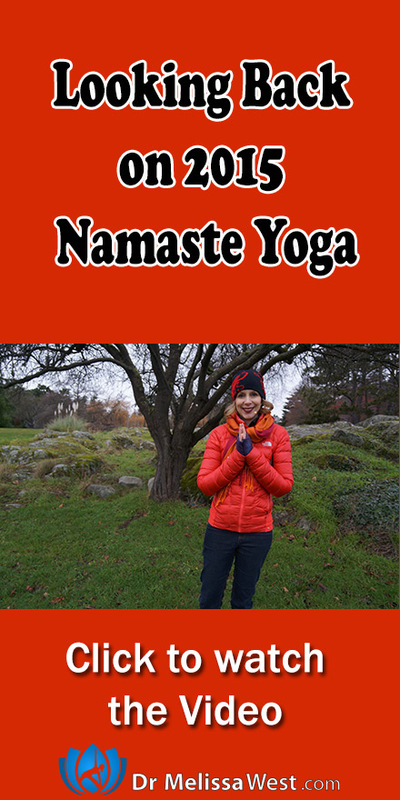 If you would like to volunteer to translate an episode of Namaste Yoga, we would love to hear from you. Before starting a new series late in 2015, I added two episodes to the Cultural Conditioning Series – The Myth of Perfect Health and the Myth of Continual Improvement. Many of you have commented on how you are loving the heart-centered kind approach of this series. The highlight of this year was definitely celebrating 300 episodes with our Live Feed and a look back at 6 years of giving away free one hour yoga videos every Friday for the last six years. Our YouTube Channel continues to grow we passed 3 million views this summer- I made a mala and gave it away in celebration and we are steadily growing towards 4 million views now thanks to your support.